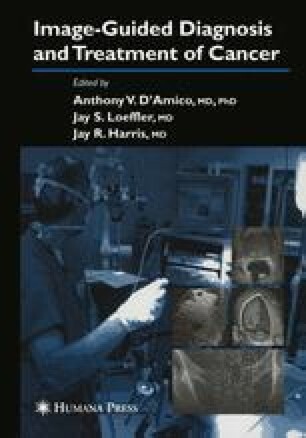 As clinical investigation into the utility of magnetic resonance imaging (MRI) as a breast-imaging tool continues, there is now a large body of evidence demonstrating the increased sensitivity of MRI in the detection of breast cancer compared with conventional imaging methods, with reported sensitivities for the visualization of invasive breast cancer approaching 100% (1–5). The reported sensitivities of MRI for the visualization of ductal carcinoma in situ (DCIS) have been more variable, ranging from 40 to 100% (6–10). It has been demonstrated that not only can MRI visualize breast cancer but mammographically, sonographically, and clinically occult breast cancer, both invasive cancer and DCIS, as well. MRI has been shown to be more accurate than mammography and ultrasound in determining the size of the primary breast cancer and in the detection of multifocal, multicentric, and bilateral breast cancer (11–18). In addition to these studies, which have evaluated MRI in the diagnostic setting, there are now reports of MRI-detected breast cancer in the screening setting, specifically in the evaluation of women at high risk for the development of breast cancer (19–21).